Fullmetal Alchemist: Dual Sympathy (鋼の錬金術師 デュアルシンパシー Hagane no Renkinjutsushi Dyuaru Shinpashī?) is a video game created by Bandai for the Nintendo DS. 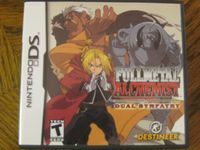 The game was released in Japan on July 21, 2005, just two days before the first Fullmetal Alchemist Movie came out, and was accompanied by a PlayStation 2 release of Fullmetal Alchemist 3: The Girl Who Succeeded God. Dual Sympathy was announced by Destineer on September 12, 2006 for release in North America during Fall 2006. It has gone gold on November 27 and was released on December 12, 2006." Source: Wikipedia, "Fullmetal_Alchemist_Dual_Sympathy," available under the CC-BY-SA License.